Here at APH, we don't usually review software -- especially those related to internet security. The reason is simple: Limited resources, and of course, I don't play around with them as much as I do with hardware (Especially in the peripherals and consumer electronics area) -- so a second contributing factor is probably my limited knowledge. But when the DHL man handed me my copy of SteelSecurity from SteelSeries (You see, I said to Thomas at SteelSeries that I probably can't write a good review on this product quite a while back, but the real encouragement comes in when they sent it to me anyway), I know that this would be something that I got to try out one day. Well, to be honest, again with limited resources there's only a several things that I can cover today: Features (Including ease of use), and performance (Scan speed, resource usage). What I can't do is detection rate and heuristics -- which is what I really regret on because even with my limited knowledge, I know that's one of the main points of internet security software. But anyway, let's see what I can come up with today. Our review unit came from Denmark using DHL Express from SteelSeries in a bubble pack. It's really something I didn't expect, as I said earlier. At first, I was like, "What's this? ", but the packing list reveals the truth. Oh, the truth! AHHH! Yes, I am normal. Anyway, inside the bubble envelope is a full-size software box, which I haven't seen for quite a while now as most retail software is in much smaller packaging. With nice fancy icons on the box as well as outlining its features and information regarding this product all over its retail box, you'd get a good idea of what SteelSecurity is and what it does. Out of the retail box, you'll get an instruction manual that briefly goes over installation and registration as well as a short run of each feature. A DVD-case encloses the SteelSecurity installation CD along with a CD Key behind the SteelSecurity installation CD. After popping in the installation CD into my optical drive, installation was quick and easy. A reboot is required, and once that is done we'll be off into configuring SteelSecurity. You'll be required to register after the program executes on startup. All it takes is your email and your password; you'll be given the option to subscribe to their newsletter or not. If you are already registered, you can log in at this point. Assuming you don't already have an account, registration is quick and the next step requires a CD Key (16 character key in blocks of 4 located behind your installation disc on the case). Like Steam, the CD Key will then be associated with your account and future installations require only a log in and not the CD Key. This is a good way to prevent piracy, keygens, and activation woes. 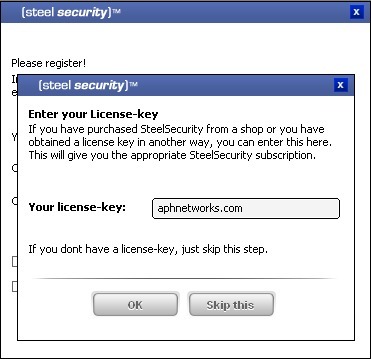 SteelSecurity comes with 1 year of subscription and allows you to install it on up to 3 computers. Clicking on "Skip This" will allow you to use the software for up to 5 days before associating a CD Key to your account is required. It can be configured to remember your login at the beginning of every bootup. After log in, an annoying screen saying "You are now protected against hackers" (Or something to that effect) can be disabled as well, fortunately. 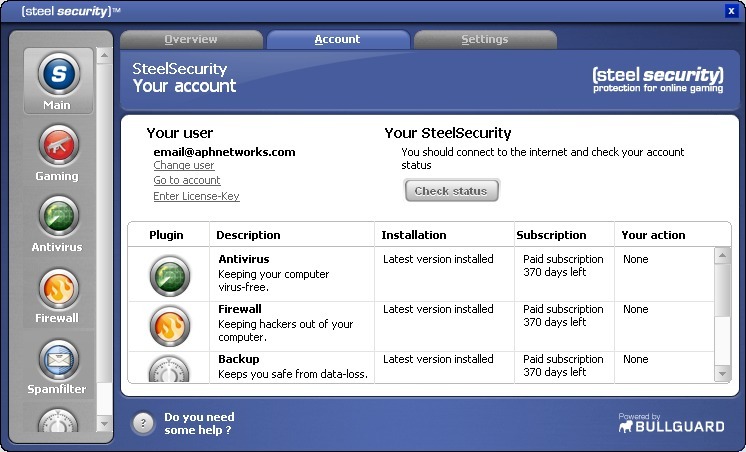 The main screen of SteelSecurity. It is fairly easy to use and everything is organized into categories on the left, with subcategories under tabs at the top. The Overview tab displays the status of each feature (Firewall, antivirus, etc) and further recommended action (Such as a required scan or update) if there is any. Configuration is very straightforward for both beginners and advanced users. Under the Accounts tab will show the status of your account and remaining subscription days. It is actually 370 days instead of 365 or 366 days for the "1 year included subscription". There are some very unique features to SteelSecurity that you probably won't get with other internet security suite. Firstly, as a gaming company, SteelSeries has included what they call "Game Profiles" with SteelSecurity. What this does is automatic configuration for a number of recognized games -- and during this, it will optimize itself to use minimal system resources as well as disabling all updates and scans to prevent interruption during gaming sessions. Game profiles will automatically load when you attempt to launch a game. For example, when I opened up Counter-Strike: Source for the first time after installing SteelSecurity, it correctly detected it as "Half Life 2 + Mods" and prompted me if I wanted to load the game profile for that. There is also an option of not asking me again. Another interesting feature is Backups -- SteelSeries is currently offering up to 1GB of space for you to backup files on their servers for as long as your subscription lasts. You can also set it to synchronize with certain directories on your computer. The only thing I did not like in regards to the SteelSecurity main window itself is that you cannot resize or minimize it; it just stays there unless you bring another window into focus. It's a minor thing though, but it can be a bit annoying sometimes. The firewall. It will prompt you for new programs that access the internet; there are two checkboxes you can check or uncheck as shown in the screenshot above. If nothing is selected within a given period of time, it will automatically send a report and block the program until you choose to unblock it later within SteelSecurity. Interestingly, there are a lot of programs it does not recognize by default -- including Steam, Firefox, Windows Live Messenger and more. The only ones I've seen it automatically configure as far as I remember is Windows FTP and networking services (Such as establishing PPTP VPN connections). Like I said earlier, I don't have the resources to analyze how good SteelSecurity is at detecting malware. But what I can do is take a look at its resource usage. Well, I had Norton Internet Security 2004 installed before (Trust me, it's not THAT bad as how people likes to portray it). I'll use Norton Antivirus for scanning performance results analysis against SteelSecurity, which is powered by BullGuard. With Norton Internet Security installed, it adds around 8 processes to my system which the processes itself takes 42272K of RAM. With Norton Internet Security's window opened (Man, it takes quite a while just to open it), it takes 18640K of RAM extra. With Norton Antivirus opened, it takes 23272K of extra RAM. With both opened, well, simply add the two numbers together. Interestingly, I "mysteriously" found an extra 150MB of free RAM right after I uninstalled Norton Internet Security 2004. Initially the single SteelSecurity process (SteelSecurity.exe) uses around 6932K of RAM minimized on system tray. Not sure why, but after the profiles and other things has been configured, RAM usage hovers around 29944K. After taking a look at overall free RAM with the same programs and processes running, I freed around 108796K of RAM after changing from Norton Internet Security 2004 to SteelSecurity. Norton Antivirus 2004 utilized around 25-100% CPU, with an average of 50% CPU usage (Interesting, I don't have a multicore CPU). Peak RAM usage went at 142744K during the scan, with an average of 47164K. The test completed in 19 minutes and 57 seconds. SteelSecurity's peak RAM usage went to 65128K during the scan, which is compared to Norton Antivirus' 142744K peak. Other times are much lower, but scanning is fairly slow as it completed the same test in 22 minutes and 34 seconds. Norton Antivirus 2004 is obviously not a fast virus scanner, and since SteelSecurity is slower than that, it's not a good sign. CPU usage is around 30-100%, with certain times around 100% when digging through archives with the rest of time around 60%. Resource usage is acceptable though. The SteelSecurity antispam feature integrates with major email programs such as Microsoft's Outlook. A new toolbar is added (Almost identical to Norton AntiSpam, just different icons) to mark something as spam or not spam. A wizard can be manually started via the new toolbar or that it automatically starts the first time you run Outlook after installing SteelSecurity. The wizard configures where your Spam folder is, and digs through your emails to "learn" non-spam and spam patterns. Good idea, but I've tried to run it twice to dig through my emails to learn patterns of my emails and Outlook crashed both times as the dig is in progress. 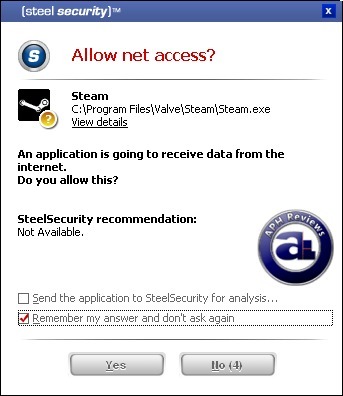 Overall, SteelSecurity is a great approach to internet security with gaming in mind. With unique features such as gaming profiles as well as online backup, its resource usage is also very acceptable. Easy to use and well optimized for both beginners and advanced users, as well as no requirement for CD Key for every installation, SteelSecurity is a great piece of software -- but scan speed really needs improvement, and there is room for minor improvements in certain areas. I don't have much to compare to in terms of resource usage and scanning performance, and I don't have any results for detection rate due to limited resources as I mentioned earlier. You'll have to check other reviews for that if someone else can put that in. I can't give a definite recommendation of how good this really is, but from what I have, it's a great product with many advantages and certain insignificant drawbacks. If you want to pay the $69.00 for it, that is. Special thanks to Thomas over at SteelSeries for making this report possible. Easy to use, acceptable resource usage as well as nice unique features. Scan speed can be improved. posted 13 hours and 38 minutes ago, with 1 posts. posted 13 hours and 39 minutes ago, with 7 posts. posted 13 hours and 41 minutes ago, with 6 posts. posted 13 hours and 43 minutes ago, with 14 posts. posted 13 hours and 44 minutes ago, with 58 posts. posted 13 hours and 44 minutes ago, with 13 posts. posted 13 hours and 44 minutes ago, with 10 posts. posted 13 hours and 45 minutes ago, with 12 posts.